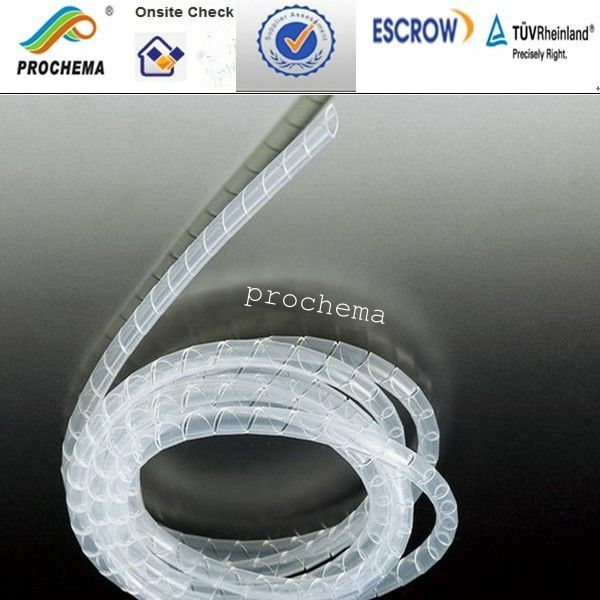 FEP tube is made from FEP resin and prepared by the technology of thermoplastic extrusion and blowing. It has non-sticking, heat-resistance, aging resistance, corrosive resistance, non-flammability and good electric property. It can be solid adhesive for PTFE and also a good adhesive for laminating various materials. Its working temperature is up to 200 and is an ideal material for circuit board and flat cable. make the magma sample in the field of oil field ect. Various frequentcy electric wire ,electric cable sheath , slot insulation tube(submersible motor wiring harness with slot insulation pipe, air conditioning components with tube). Installation method is used to edit The use of the winding pipe installation machine and manual installation. Machine installation requires Place similar to the water hose cloth winding machine style of equipment. Manual installation the following description: 1. The rubber hose, wire, cable) in the middle part of the circle is in the middle of the winding pipe part, starting from the wound good middle to hose, wire, cable) at one end of the turn around. 2. The hose (wire, cable) end around the winding tube position in rubber hose, wire, cable) shall prevail. Positioning turning spiral case in loosen, can move, start from the wound good middle part to the other end. 3. Will the two ends of the winding pipe all wrapped around the outside of the hose, wire, cable), the installation is complete. Note: wire and cable can be used branch for installation. Below melting point ,it won’t stick any project.Above melting point, it has perfect adhesive property with PTFE, Metal and self-adhesion(heat sealing). 60HZ-60MHZ,Under the high and low temperature,thepermittivitykeeps2.1even if the surface damaged ,it won’t has conductive track. Anti-corrosion:Only in high temperature, Fluorin and alkalis can effect it,others acid,alkali or ester won’t effect it. Fireproof :If firing, and will still insulate . Dia ø1.5 --300mm, Thickness: 0.015mm to 0.75mm. Length :50mm to unlimited. For UV lamp T4 T5 T8 T10 T12 , Thickness 0.2 to 0.5mm . Anticorrosion: not effected by any Strong acids, bases, oxidizers and almost all solvents.